Polymer-Based Nanocomposites for Energy and Environmental Applications provides a comprehensive and updated review of major innovations in the field of polymer-based nanocomposites for energy and environmental applications. It covers properties and applications, including the synthesis of polymer based nanocomposites from different sources and tactics on the efficacy and major challenges associated with successful scale-up fabrication. 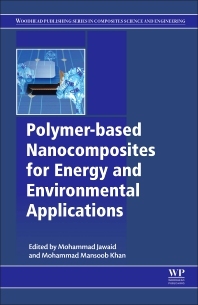 The chapters provide cutting-edge, up-to-date research findings on the use of polymer based nanocomposites in energy and environmental applications, while also detailing how to achieve material’s characteristics and significant enhancements in physical, chemical, mechanical and thermal properties. It is an essential reference for future research in polymer based nanocomposites as topics such as sustainable, recyclable and eco-friendly methods for highly innovative and applied materials are current topics of importance. Mohammad Mansoob Khan is working as a Professor (Senior Assistant), at the Chemical Sciences, Faculty of Science, Universiti Brunei Darussalam, Brunei Darussalam. He earned his Ph.D. (Chemistry) from Aligarh Muslim University, Aligarh, India. Dr. Khan has more than 15 years of teaching and research experience and has worked in different countries (India, Ethiopia, Oman, and South Korea) and taught various courses at undergraduate and postgraduate levels. Currently, Dr. Khan is working in the cutting edge area of nanochemistry, nanosciences and nanotechnology especially in the field of synthesis of inorganic nanohybrid materials such as polymer, metal, metal oxide nanocomposites and band gap engineering of nanomaterials. Potential applications of synthesized nanomaterials include H2 production, solar cells, environmental remediation, photocatalysis, photoelectrodes, optoelectronic devices, capacitors and sensors. Dr. Khan has published more than 65 research and review articles in international journals of repute, 5 book chapters and 2 edited books. He also has 4 patents in his credit. Dr. Khan is in the editorial board member of several international journals as well as books and an active reviewer of dozens of high impact peer reviewed international journals.